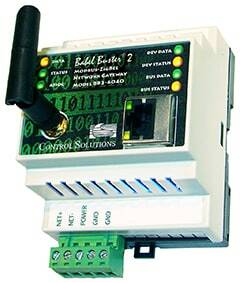 The Babel Buster BB2-6040 Modbus to ZigBee gateway connects Maxstream ZigBee devices to a Modbus network. 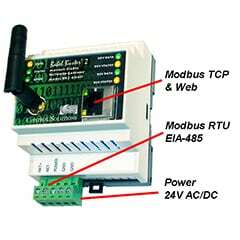 The BB2-6040 is a Modbus TCP client/server and Modbus RTU master/slave device that functions as a ZigBee Coordinator and gateway. After setting up the appropriate mappings in the BB2-6040, data from MaxStream ZigBee sensors will appear as Modbus holding registers on Modbus TCP or Modbus RTU. Data written to Modbus registers can also be propagated to MaxStream ZigBee actuators by the BB2-6040. Up to 400 registers may be mapped to up to 100 ZigBee devices. The BB2-6040 operates primarily in Listen mode, simply waiting for ZigBee devices to report in. When the ZigBee devices do report in, the BB2-6040 searches its known device list and data maps to see if the reported data should be saved as a local Modbus register. 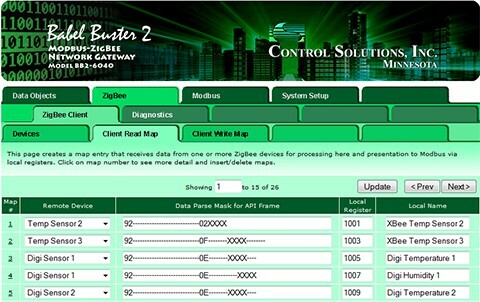 Control Solutions’ Babel Buster® BB2-6040 is a Modbus® client/server device that functions as a ZigBee Coordinator and gateway. The ZigBee capabilities are identical to the BB2-7040 BACnet/ZigBee gateway. 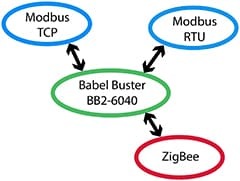 After setting up the appropriate mappings in the BB2-6040, data from ZigBee sensors will appear as Modbus registers via Modbus TCP or Modbus RTU. 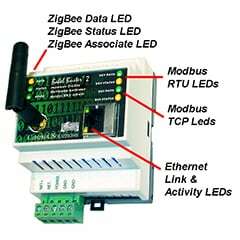 Data written to Modbus registers can also be propagated to ZigBee actuators by the BB2-6040. The collection of Modbus registers found in the BB2-6040 will maintain the most recently received ZigBee data. Other Modbus masters may query the BB2-6040 server to obtain that most recent data accessed as a holding register. Modbus masters may write to any of the BB2-6040’s holding registers to send data to a ZigBee device when mapped for writing. The BB2-6040 will transmit to the ZigBee device, and a properly configured ZigBee device will receive the transmission at the end of its sleep period. The BB2-6040 may also function as a master, and will use holding register writes to share data with Modbus slaves. The BB2-6040 therefore has the ability to transfer data between ZigBee devices and other Modbus devices that operate as a slave only. Access to ZigBee devices based on the Digi/MaxStream RF modules can be configured using fill-in-the-blank templates. Raw ZigBee access is supported for any other variation of device. You can use the BB2-6040’s built in Script Basic to program more complex ZigBee related algorithms if you wish. Access to the ZigBee port is handled via Basic’s file I/O statements (e.g. print #1). The BB2-6040 firmware is field upgradeable. As new features and preconfigured devices are added to the library, you will be able to add these features with a simple file upload to upgrade. Control Solutions does not charge extra for upgrades, even when upgrading to add features. 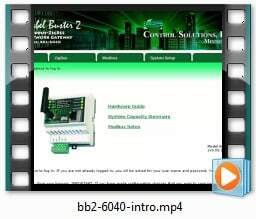 The BB2-6040 includes its own internal web server that provides a web based user interface for configuring the BB2-6040. Configuration is done using simple templates, and each web page has an online help section at the bottom. Click the link below to view a demo copy of the entire Web UI in the BB2-6040. ZigBee device configuration shown for BACnet version. ZigBee setup works the same - just substitute Modbus register numbers instead of BACnet objects.